As you can see, placing water is as easy as clicking and dragging with the mouse. This actually lowers the land and fills in with water. 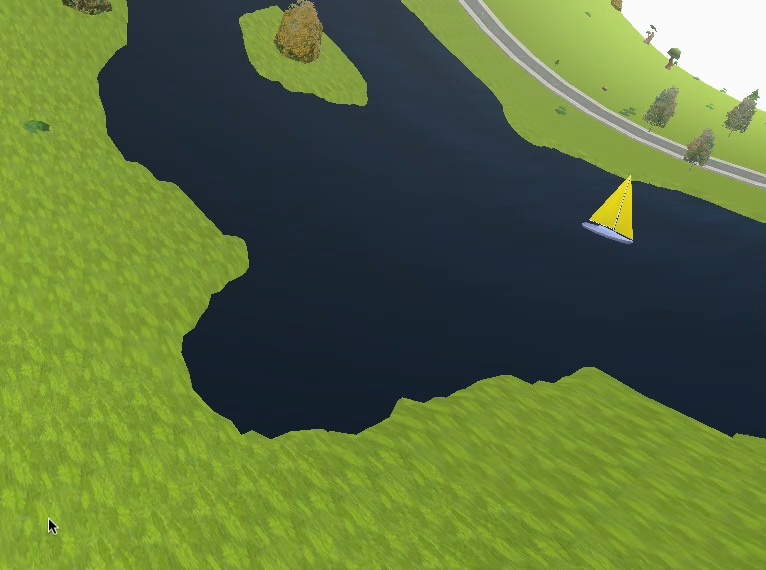 Removing the water and restoring the land is just as easy; we’re using shift-click for that in our prototype, though the user interface in the final game may be different. In game terms, water will increase the value of the land around it, and increase the happiness of your residents. It will also have recreational value; when bodies of water are large enough, small boats and other water sports will start to appear. Keep in mind that the space colony shown in this prototype is just about the smallest possible space colony with Earthlike gravity; it’s a cylinder with a radius of 150 meters. Even so, you can see that there’s quite a bit of room for ponds and small lakes. Space colonies can get much larger than that, with quite a bit more room for this sort of play. But we like showing off the small ones, because they’re fun — where else are you going to see the surface of a lake curve right up a wall, or hang suspended over your head?